Thrilling & problematic books of 2013. In 2012 I kept a reading log for the first time, and learned that I read 68 books. I thought it would be more—like 100—but the body count still impressed me. What’s weird is that I’ve just tallied my total for 2013 and it’s again 68 books. What are the odds? And is my seemingly permanent number respectable? A 2010 post by Cynthia Newberry Martin on her fine Catching Days blog puts things in perspective. Cindy and her responders are both writers and serious readers, and nobody mentioned cracking 100. My number is apparently typical, the range roughly 40 to 78. I’m not a fast reader, nor do I desire to be. In fact, a danger for a counter is reading shorter books just to boost one’s tally. Surely it’s better, for a reading writer, to have read 40 great books than to have consumed 100 solely for diversion or bragging. As always, my 2013 list functions as a kind of diary: knowing when I read a book tends to remind me of the reading experience, as do my brief remarks. (I made an Excel spreadsheet with columns for dates, page counts, comments, etc.) Sometimes those brief judgments are coherent enough for a reader’s review on Amazon or Goodreads. My best short reviews, however, are distillations of the longer analyses I post here. I review a lot of books on this blog, which is odd because I find reviews so hard to write. Something about reviewing must appeal to me—I think it’s figuring out a book on a deeper level, really seeing how it works. Or learning why, for me at least, it doesn’t quite cohere. The Faraway Nearby opens with 100 pounds of apricots, collected from her ailing mother’s tree, ripening and rotting on Solnit’s floor, a bequest and a burden as if from a fairy tale. The fruit was a story, she explains, and also “an invitation to examine the business of making and changing stories.” So Solnit tells her own story, shows how she escaped it by entering the wider world of others’ stories, and how she changed her story as she better understood her unhappy mother and their bad relationship. By the same token, there are almost too many stories in The Faraway Nearby to list. Solnit has said she’s a collector of stray bits, her method bricolage. Using that clue illuminates her apparent working method: there’s been a patient melding, with verbal transitions for topic shifts. Though her method is collage-like, with disparate subjects juxtaposed, the white space one would expect is rare. This makes for more demanding reading—less warning of new topics and less time for a reader’s preparation. You’re immersed a new story before you know it. Some readers will get lost and bored and close the book. Toward the end, she returns to her mother and to her mother’s end, to those apricots. Pared to its bones, she tells us, this book is the history of an emergency—her mother’s traumatic decline—and of the stories that kept Solnit company then. But she tells us she’ll resist the essayist’s “temptation of a neat ending,” and indeed she does. Questions flood in, a ripple effect of the book; her method, which meditates on meaning, doesn’t always presume to supply it. This short review is the fruit of two readings of The Faraway Nearby and much writing about it here and discussing with a discerning friend who loved it without reservation. In case it’s too condensed, my lone criticism is that Solnit’s associative linking of topics with scanty expository transitions doesn’t work well for me. We’re in a particular place and time with her, and suddenly she’s at some remove, at her desk “now,” I suppose (without her telling us that), and talking about something else the foreground situation has reminded her of. 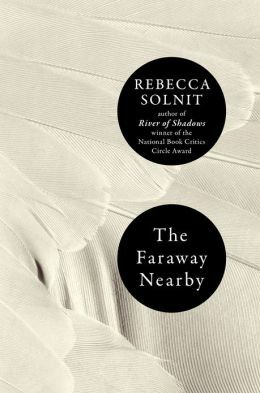 Solnit’s abstracting move won’t bother some readers at all, while others will quit. I much prefer the way Virginia Woolf, one of Solnit’s influences here, grounds the reader in time and space or in the movement of her mind in A Room of One’s Own. This makes me want to read The Faraway Nearby again, and maybe I’ll change my mind, certain in advance of what trips me. I do that of course, change my mind. I’m a fan of David Shields’s nonfiction, and last year enjoyed his Enough About You: Notes Toward the New Autobiography enough to place it briefly on my “Favorite CNF” page. Eventually I realized that for me it was completely forgettable, probably because its structure felt arbitrary, a collection of disparate pieces rather than a crafted, overarching narrative. Fans of stealth memoir, here’s your huckleberry. Next: Joshua Cody’s provocative and problematic account of cancer, [sic]: A Memoir. Wow, Richard, an Excel spreadsheet! That’s what I call dedication to your reviewing avocation (thus making it a part of your larger writing vocation as well). Happy New Year, and may you read 100 worthwhile books in the next year. Thanks, Victoria. I’ve decided I’ll be fine with far fewer, as long as I’m proud of the books! Richard, I write down quotes in my journal and some responses to books as I read them, but I have never kept a book log. I like this idea. I really resonated with the difficulty of writing reviews. I have to read a book twice and spend a lot of time thinking about the best way to approach the book before I can feel satisfied with a review. It takes a LOT of time. Which leads me to thank you for all the excellent reviews I’ve read on this site. 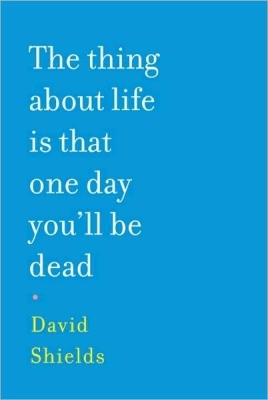 BTW, my students loved Such a Life, a book and an author I did not know about until you introduced me. I’m glad to hear that, Shirley. Such a Life is an incredible collection of memoir essays. A book really does have to be read at least twice for a good review, and I guess that’s part of the problem, because I don’t always have the time! A friend always reads a book three times . . . I too consider myself a slow reader and I’ve since realized even if I could read 100 books a year, there will still thousands of books I’ll never get to by the time I die, so I stopped worrying. Maybe I could impress more people if I could read faster. But I’d really have to question my outlook if I’m reading to impress a subset of people who will likely annoy me. I top out around 50 a year. I hit 50 this year while reading three 600-page books [takes a bow]. I then padded my stats with some graphic novels or books-formerly-known-as-comic-books. I’m a Batman junkie. I’d rather read fewer books well, than more books for the sake of reading more books. However, Joe Donahue, host of our wonderful alternative radio channel in our area (WAMC.org), is a freak. He reads about 400 books a year and he can read them for content. I know this because I’ve interviewed him, hung around him, and listened to his interviews on the radio and they are as in-depth as you’ll ever hear. Some people have the gift. I like marking up books, in pencil, with my own little notes and symbols. It brands them as mine. I used to be against this, then stopped caring since they will all end up at the bottom of an eternal ocean in the coming millenia, so I’ve stopped caring about keeping books in mint condition. When I go to re-read books, I’ll be happy to see what I once thought of them at a certain age. Happy New Year, Brendan. Reading THREE 600-page books and still hitting 50 is rather amazing. It’s kind of my goal this year, to maybe read fewer but to read more longer books. I have certainly started that way with this 800-pager by Tolstoy. I would be interested to see you post on those long ones amidst your diverse reading year. I read a couple of graphic memoirs myself. I recommend Fun Home by Alison Bechdel. “American Pastoral”, “Salinger”, and “East of Eden” were the big dogs I read. The true skill, especially from Roth and Steinbeck is: how the heck did they fill all that space and it didn’t feel weighed down. Actually, AP felt a touch fat, but still. Both are so dense and not a whole lot happens. That’s why they’re legends we write about them. “Salinger” was laborious to get through, but all in all, I still enjoyed it since “Catcher” was the first book I ever fell in love with. Happy New Year to you and I’ll heed your recommendation! Brendan, I re-read Catcher last year. Would be interesting to read your riff on it in your reading roundup . . .
Like Shirley, I’m here to thank you. I found a Kindle Fire among my Christmas gifts and have been visiting your website to find books to download. I had stopped reading as much because my eyesight is shot (visiting an opthamologist is my new year resolution). I can see much better with my backlit gift, so I’m back to devouring books. And happier for it. So, thank you, Richard. May you have a happy new year of reading and success with your memoir. Thank you, Darrelyn. Best wishes as well, and may your new device make reading easier. Hi, Richard. My book tally for last year was only 43 which puts me to shame compared to you. Anyway, I read David Shields book a couple of years ago and your blog has made me dig it up for a reread. Now that I am reading your reviews and taking many of your suggestions, maybe my tally for 2014 will be greater. Neat. So you keep a record too, Laura. Well. More than I supposed do. 43 is great! Here’s to good reading in 2014 . . .
Sixty-eight books seems admirable to me! I’m still in that part of child-raising in which I feel accomplished completing a short story in “The New Yorker.” I read many book reviews, attempting to keep up with current literary offerings, but rarely make it to the point of actually reading them. Although I do not keep a record of my own reading, I do maintain a book list of my children’s reading choices (at this point, they have each read over fifty books, not counting the ones they slipped in and didn’t tell me about). I’m going to pass on your recommendation of THE FARAWAY NEARBY to Lily. Thanks so much for reading and commenting, Sarah. I hope Lily likes it! I imagine she will. -It’s okay to show less and tell more. Or perhaps what I mean is that scene, while useful, isn’t the holy grail for nonfiction writers the way it might be in fiction. Tobias Wolff and Jeanette Walls use it beautifully but Solnit is compelling without much scene or dialogue. An alternative rule for more essayistic nonfiction might be to privilege the concrete over the abstract. -If you wander a bit from your topic, readers will trust you to come back. I agree that some may lose patience with Solnit’s digressions, but others, like me, are happy riding along. -The momentum of a book can come from the engine of someone’s thoughts rather than chronology or plot. -Solnit seems unconcerned with providing readers a lot of context or background information. Instead she trusts the accumulation of details to fill in the picture over time. I love how avoiding too much exposition lets her move freely among ideas. Just some initial thoughts. I’m hoping to say a bit more one day soon on my own blog. Thanks for these comments, Mandy. I think it’s so personal how we read a book, and as I said, my friend didn’t mind Solnit’s lack of transitions. It’s neat that you found something in the book, too, that helped yours. Oh, I’m eager to hear your reaction to Solnit’s special book!